The future plans of first romances seldom materialize, no matter how certain one party is of a future together. A cursory read through an old high school yearbook or hidden box of love letters saved in a closet demonstrates this fact. Yet the truth of such teen naiveté speaks more to the human condition than any knowledge gained as an adult. Derived from the shared experience of first love, such a moment elicits a nearly global understanding. 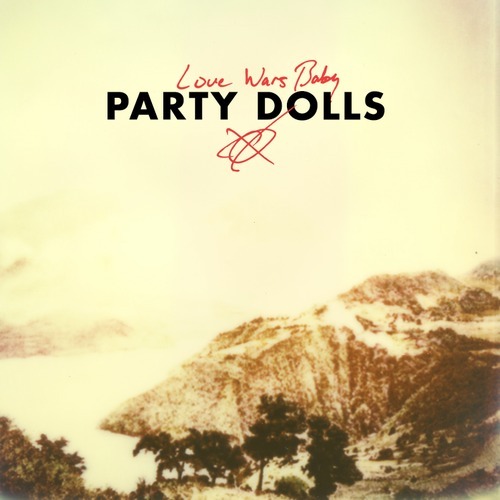 Much like a trip down memory lane, listening to Love Wars Baby by Party Dolls opens a time capsule of memories, moments and missed connections. A collaboration between Drew Beskin, Walker Beard and Frank Keith IV (The District Attorneys), Jeremy Wheatley (Crooked Fingers) and Tedo Stone, Party Dolls relish in teen metaphors (“I’m a merry-go-round”) and yearning (“I can only hope there’s room for me in your heart”) backed by simple arrangements that ably highlight the highs and (mostly) lows of Love Wars Baby‘s songs. If I sang a good line? With the exception of the country-tinged singalong, “Sweetheart Moon,” Love Wars Baby is bubble gum pop. Underneath the sheen and reverb, it’s a long-since-passed look back at love gone wrong, a retelling of missed chances where the pain has yet to fully scab over. To pick at such a wound only exacerbates the misery yet in turn aids the healing process. Over time, the pain subsides to an itch that every so often serves as a reminder how these experiences have formed who one has become. Released today (Valentine’s Day) via This Is American Music, you can stream/purchase Love Wars Baby below.